After hosting a recent labyrinth walk, I stopped by a convenience store in downtown Tucson, one that I visit from time to time. I pulled up to the drive thru window, and one of the two younger men that work there opened the window and smiled when he saw me. “I saw you in a documentary, and you were talking about esoteric things. I’ve been waiting until you came in again to tell you.” “Huh? Me?” I asked, a bit confused. “Yeah, it was a documentary about human ashes in copper cans in a mental institution.” I knew exactly what he was talking about! In the late summer of 2009 or 2010 (can’t remember which now), I was in Portland, Oregon, visiting my mother, Sue Ellen Liss. She got a call from a director who was in town to film a documentary about some human cremated remains found in copper canisters, hidden away in a shed at the Oregon State Mental Institution ( where the movie One Flew Over the Cuckoos Nest was filmed) in Salem, Oregon. They wanted to add an element to the film about the idea of “crazy” and how people were considered “insane” and committed to mental institutions. They found my mom because of her website www.heartspace.us, which describes her work with mothers using the Expressive Arts. When she spoke with them she said “You should talk with my daughter, she is a shamanic practitioner.” I thought it was an interesting idea, and even though secretly I thought that nothing would come of it, I agreed to talk with them. So, one afternoon my mom and I met their team at a large city park (Washington Park) to be interviewed. The director and producer Ondi Tominer asked us some questions on film, we signed releases, and said goodbye. I never heard about it again and I forgot about it. Until now. While sitting in the car at the drive thru, all these details came rushing back. “Wow! I remember that…I never heard any more about it- I’m so glad you saw it and told me!” He said “It is called Library of Dust”. Well, of course I looked it up as soon as I got home! It became a 17 minute documentary that won a number of awards in the Film Festival circuit of 2011 (wow!). I found a streamed version for 2.99$ and was eager to watch! 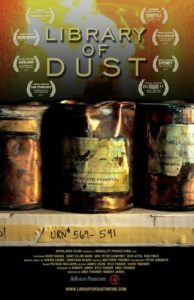 It is a story of forgotten and “throw away” people, and what this particular institution chose to do with the cremated remains of those who went unclaimed. This was a powerful and true tale. They also approached the subject of what is considered “insane” in a culture. They brought up how many people, often women, were committed because of many reasons that today would not be considered “crazy”. Depression. Refusal to obey “authority”. Behavior considered unorthodox. So many reasons people used “mental illness” and institutionalization as weapons against people who were different. I felt that this aspect was such an important story to share with the public. As I was watching, I heard my voice. I was talking about Spirits. Spirits of these dead people who wanted their stories to be known. There I was, with my mother, speaking these words. Under me were the words “Quynn Elizabeth (my middle name, how I was known then) Shamanic Practitioner”. Then at the end, my voice again, closing the documentary. Wow! I am honored to have been included, and it is so fascinating how this knowledge was brought to me. Synchronicity to a high degree. Would I have found out another way in another time? Maybe. Probably. Maybe not. I trust that the Spirits wanted me to know this information now. How do I know this? The day before this experience I set an intention to help and train people who are realizing that they do hear, see, and know things that others do not, and that they are not crazy simply for having these gifts. Considering what I said in the film, about how the Spirits of these people wanted their stories known, I am sure that some of them were institutionalized for having experiences like I do, and those I work with, and many others were there because they simply did not have the support, therapy and acceptance in their lives, that many of us have now. I am traveling to Portland, Oregon in May, and now I know that I will travel to Salem (south of Portland) to this institution to offer a releasing ceremony for the Spirits of the people who have not been claimed. It will be an honor. For those of us in the spiritual, empathic, pagan and shamanic communities, and our ancestors who too had these abilities, we have been called crazy, weird, or possessed by demons. Many are/were medicated and/or institutionalized against, or with, their will. The story of the people highlighted in “Library of Dust”, and their unclaimed remains, is a part of this greater story. To all of these Spirits, and all others of similar fate around the world, you are not forgotten. Thank you Ondi Tominer of Interloper Films for making this film, and feeling the truth of my words to include them. The Spirits are indeed being heard.